The timer of the Mitsubishi plc FX series is a power-on delay timer. Its working principle is that after the timer coil is energized, the delay starts, the time is up, the contact action; when the timer coil is powered off, the timer The contact is instantly reset. However, in practical applications, we often encounter control requirements such as power-off delay, time-limited control, and long delay, which can be achieved through programming. The delay on control program is shown in Figure 3-27. The control function it realizes is that after X1 is turned on 5, Y0 has output. When X1 is in the 0N state, the coil of the auxiliary relay M0 is turned on, and its normally open contact is closed and self-locking, so that the coil of the timer T0 can be kept in the power state. 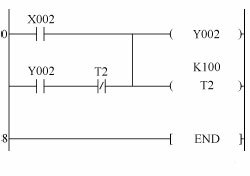 After the coil of T0 is turned on for 5 s, the current value of T0 is equal to the set value, the normally open contact of T0 is closed, and the coil of output relay Y0 is turned on. 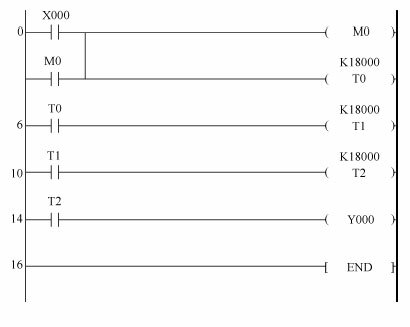 When X2 is in the ON state, the coil of the auxiliary relay M0 is turned off, the timer T0 is reset, and the normally open contact of T0 is turned off, so that the coil of the output relay Y0 is turned off. The delay off control program is shown in Figure 3-28. The control function it implements is that the output stops working after the input signal is disconnected for 10s. 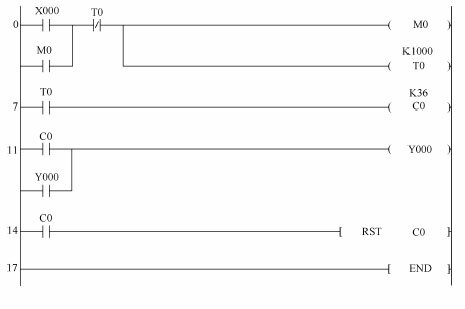 When X0 is in the ON state, the coil of the auxiliary relay M0 is turned on, its normally open contact is closed, and the coil of the output relay Y3 is turned on. However, the coil of timer T0 will not be energized (because its front ( ) is off). When X0 changes from ON to OFF, ( ) is in the on state, and timer T0 starts counting. After l0s, the normally closed contact of T0 is opened, the coil of M0 is de-energized, and the output relay Y0 is disconnected. In actual engineering, it is often encountered to limit the working time of the load to a specified time. This can be achieved by the program shown in the figure, which implements the control function of controlling the maximum working time of the load as l0s. The program can achieve the minimum working time to control the load. The control function implemented by this program is that the minimum working time of the output signal Y2 is 10s. In the PLC, the timer’s timing is limited, the maximum is 3276.7s, less than lh. To achieve longer timing, you can use two or more timer cascades, or use a timer with a counter, or use a counter with a clock pulse. When the timer is used in cascade, its total timing is the sum of the time set by each timer. Figure Use two timers to complete the 1.5h timing. When the timing is up, Y0 is powered. The timing of 1h is completed with a timer and a counter. When X0 is turned on, M0 is powered and self-locked, and timer T0 generates a pulse sequence with a period of 100s by itself resetting as a count pulse of counter C0. When the counter has 36 pulses, its normally open contact closes, causing output Y0 to turn on. From X0 to Y0, the delay time is 100s x 36 = 3600s, which is 1h. Figure 3-33 shows the timing of 1h with two counters. 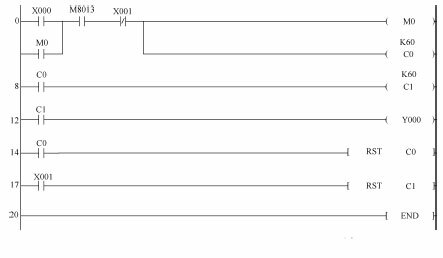 M8013 (1s clock pulse) is used as the count pulse of counter C0. When X0 is turned on, counter C0 starts counting. After 60 pulses (60 s) have been counted, its normally open contact C0 sends a count pulse to counter C1 and resets counter c0. The counter C1 counts the c0 pulse. When 60 pulses are counted, the normally open contact of C1 is closed, and the output Y0 is turned on. From X0 to Y0, the timing is 60s x 60 = 3600s, which is 1h. The PLC running cumulative time control circuit can be used in combination with M8000, M8013 and counter to compile the display circuit of seconds, minutes, hours, days and years. 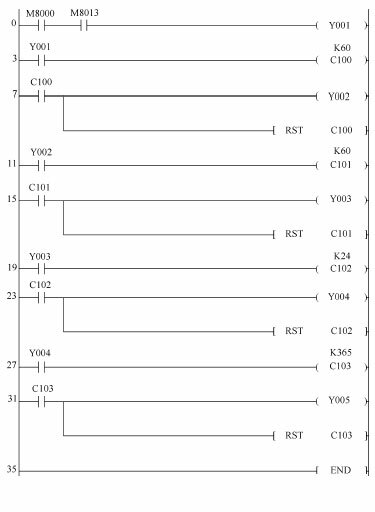 Here, you need to use the power-off type counter (C100~C199), so that the accumulated time of each power-on can be timed, as shown in the figure. This entry was posted in plc program and tagged plc timer, plc timer and counter examples, plc timer example, plc timer function on October 31, 2018 by arco.